1. PNCER2326, “CFD Analysis of Erosion in Piping System at Shedgum Gas Plant”, submitted to Zamel & Turbag Consulting Engineers, 2005-06 (Role: P). 2. PNME2256 “Evaluation Criteria for High Gas velocity in Piping Systems”, submitted to Saudi Aramco, 2005-06 (Role: P+D). 3. PNCER2312, “Effect of Harmonics Resulted from the Operation of SVC’s and Large Capacitor bank Installations on Power System and Customers and their Remedial Measures Condition”, submitted to Saudi Electricity Company, Riyadh, 2006-07 (Role: C+E). 4. PNCER2335, “Study to assess the condition of two STC buildings and suggest repair and rehabilitation methodologies”, submitted to Saudi Telecom company, Riyadh, 2006-07 (Role: C+E). 5. PNCER2338, “Evaluation of curing methods for concreting under hot weather conditions”, submitted to Saudi Aramco, 2006-07 (Role: C+E). 6. 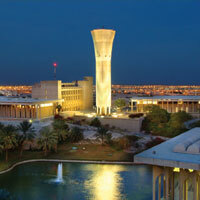 PNCER2332, “Transfer of KFUPM Insulator Research Station in Riyadh”, submitted to Savola Packaging Systems Co. Plastic Factory, Riyadh, 2006-07 (Role: C+E). 7. KACST Proposal, “Dynamic and Diffusional Transport Properties of Oxide-Metal Interfaces in Thermal Barrier Coating Systems for Gas Turbine Blades”, submitted to KACST, Riyadh, 2007-08 (Role: C+P). 8. PNCER2340, “Concrete weight coating utilizing iron ore and steel slag aggregates”, submitted to Saudi Aramco, 2007-08 (Role: C+E). 9. PNCER2341, “YANPET seawater study”, submitted to SABIC, 2007-08 (Role: C+E). 10. KACST Proposal, “Development of a web-based national corrosion inventory system, (NCIS)”, submitted to KACST, Riyadh, 2007-08 (Role: C+E). 11. KACST Proposal, “Assessment of a very large scale photovoltaic (vls-pv) power plant based electricity generation in Saudi Arabia”, submitted to KACST, Riyadh, 2007-08 (Role: C+E). 12. KACST Proposal, “Wind power assessment at different locations in Saudi Arabia”, submitted to KACST, Riyadh, 2007-08 (Role: C+E). 13. KACST Proposal, “Saudi Legal Unit for Voltage & Resistance”, submitted to KACST, Riyadh, 2007-08 (Role: C+E). 14. KACST Proposal, “Establishment of a primary level lab facility to calibrate air velocity sensors”, submitted to KACST, Riyadh, 2007-08 (Role: C+E). 15. KACST Proposal, “Measurement of Activity of different Radio nuclides present in Sand samples collected from different locations in the Eastern Province of Saudi Arabia”, submitted to KACST, Riyadh, 2007-08 (Role: C+E). 16. KACST Proposal, “Development of nano-composites for corrosion and wear resistance”, submitted to KACST, Riyadh, 2007-08 (Role: C+E). 17. KACST Proposal, “Development of solar cells”, submitted to KACST, Riyadh, 2007-08 (Role: C+E). 18. KACST Proposal, “Development of coatings for thermal barrier coating systems for turbine blades”, submitted to KACST, Riyadh, 2007-08 (Role: C+E). 19. PNCER2342, “A study on utilizing sulfur concrete in structural components and development of a stable sulfur modifier”, submitted to Saudi Aramco, 2007-08 (Role: C+E). 20. KACST Proposal, “Producing high quality concrete utilizing steel slag aggregates”, submitted to KACST, Riyadh, 2007-08 (Role: C+E). 21. KACST Proposal, “Preparation of nano-size stabilized zirconia ceramics by high temperature hydrolysis”, submitted to KACST, Riyadh, 2007-08 (Role: C+E). 22. KACST Proposal, “Construction of sophisticated flow loop for studying the erosion-corrosion and multiphase flow in oil and gas pipelines”, submitted to KACST, Riyadh, 2007-08 (Role: C+P). 23. KACST Proposal, “Construction of a novel rig to determine the susceptibility of engineering materials to stress corrosion cracking using small fracture mechanics specimen”, submitted to KACST, Riyadh, 2007-08 (Role: C+P). 24. PNCER2346, “Evaluation of Power Quality in SEC Transmission Systems”, submitted to Saudi Electricity Co., Riyadh, 2007-08 (Role: C+P). 25. PNCER2345, “Protection of open lagoon seawater intakes: Qurraya water intake case study”, submitted to Saudi Electricity Co., Riyadh, 2007-08 (Role: C+P). 26. PNCER2347, “Captive Power Generation Policy and Potential”, submitted to Saudi Electricity Co., Riyadh, 2007-08 (Role: C+P). 27. PNCER2352, “Inspection of corbels and beam connections”, submitted to Al-Ghazzawi Law Firm, 2007-08 (Role: C+P). 28. PNCER2353, “Study of a Multi-System Concept Solar Power Plant for Electricity and Water Generation in Saudi Arabian Environment”, submitted to Saudi ARAMCO, 2007-08 (Role: C+P). 29. PNCER2356, “Energy conservation in a Saudi Aramco office builfduing”, submitted to Saudi ARAMCO, 2007-08 (Role: C+P). 30. PNCER2357, “Study on black powder from gas pipeline and its commercial utilization as construction materials”, submitted to Saudi ARAMCO, 2007-08 (Role: C+P). 31. PNCER2359, “Wind Power Potential Assessment and Utilization at Shaybah Oil Facility of Saudi ARAMCO: Phase-I”, submitted to Saudi ARAMCO, 2007-08 (Role: C+P). 32. PNCER2362, “Trend Analysis of Climatic Variables and development of a Web-based Application for their Retrieval”, submitted to Saudi ARAMCO, 2007-08 (Role: C+P). 33. KACST Proposal, “Long Term Study of Air Pollution, Desertification and Climate Change in the Coastal Regions of Saudi Arabia”, submitted to KACST, Riyadh, 2007-08 (Role: C+P). 34. PNCER2364, “Cementitious Sealing Slurry as Salt Resistant Materials for Protection of Concrete Structures by Examination of Corrosion Effects on the Reinforcements”, submitted to Wacker Chemicals Middle East, Dubai, 2007-08 (Role: C+P). 1. CER2326, “CFD Analysis of Erosion in Piping System at Shedgum Gas Plant”, 2005-06 (Role: C+E). 2. ME2256, “Evaluation Criteria for High Gas velocity in Piping Systems”, 2005-06 (Role: C+E). 3. CER2298, “Wind Energy for Remote Villages, Phase II”, 2006-07 (Role: C+E). 4. CER2322, “Study of energy conservation in Saudi Itasalat building, Riyadh”, 2006-07 (Role: C+E). 7. CER2297, “Study of Grid Connected Wind Farm, Phase II”, 2006-07 (Role: C+E). 8. CER2356 “Investigation of Voltage Harmonics and Unbalance in Transmission Network”, 2006-07 (Role: C+E). 9. CER2316 “Development of Energy Efficiency Database for Household Refrigerators, Washing Machines, and Air Conditioning”, 2006-07 (Role: C+E). 10. CER2275 “Size Optimization of Concrete Thrust Anchor Blocks for Pipelines”, 2006-07 (Role: C+E). 11. CER2324 “Study of Industrial usage of cement kiln dust-Phase II.”, 2006-07 (Role: C+E). 12. CER2325 “Public Campaign Awareness about Energy Labels for Household Equipment”, 2006-07 (Role: C+E). 13. CER2307 “Development of Electricity Generation & Transmission Plan (EGTP)”, 2006-07 (Role: C+E). 14. CER2299 “Investigate the Utilization of Peak and Off-Peak Prices”, 2006-07 (Role: C+E). 15. CER2312 “Effect of Harmonics Resulting from the Operation of SVCs and Large Capacitor Bank Installation on Power System and Customers and their Remedial Measures”, 2007-08 (Role: C+E). 16. CER2319 “Seminars for Saudi Telecommunication Company”, 2007-08 (Role: C+E). 17. CER2338 “Evaluation of curing methods for concreting under hot weather conditions”, 2007-08 (Role: C+E). 18. CER2341 “Yanpet Seawater Pond Study”, 2007-08 (Role: C+E). 19. CER2338 “Testing of SEC HTV Silicone Rubber & RTV Silicone Rubber Coated Long Rod Porcelain Insulators”, 2007-08 (Role: C+E). 1. Materials and Corrosion Consultancy for Defense Industry. Submitted to Royal Saudi Air force, 2005-06. 2. Corrosion in Marine Environment. Submitted to Royal Saudi Air force, 2005-06. 3. Developing mix design for self consolidated concrete using local materials. Submitted to Royal Saudi Air force, 2005-06. 4. High quality concrete utilizing steel slag aggregates. Submitted to SABIC R&T, 2005-06. 5. Development of Pavement Management System for Asir Area Road Network. Submitted to Asir Municipality, 2005-06. 7. Development of Pavement Management System for Jouf Area Road Network. Submitted to Jouf Municipality, 2005-06. 8. Insulator Field Testing Sites. Submitted to Saudi Electricity Company, Riyadh, 2005-06. 9. Insulator Field Testing Sites. Submitted to Saudi Electricity Company, Riyadh, 2005-06. 10. Study on failure of vibrating screens. Submitted to CSD-Saudi Aramco, Dhahran, 2005-06. 11. Power Quality Enhancement for Industrial Distribution System. Submitted to SABIC Industries and also Saudi Aramco, Dhahran, 2005-06. 12. High performance/heavy weight concrete utilizing steel slag aggregates. Submitted to Saudi Iron and Steel Company (HADEED), 2005-06. 13. Evaluation of Ternary cements for improving concrete Durability in the Arabian Gulf. Submitted to Saudi Aramco, 2005-06. 14. Developing mix design for self consolidated concrete using local materials. Submitted to Saudi Aramco, 2005-06. 15. Riyadh Insulator Field Testing Site. Submitted to Electricity and Co-generation Regulatory Authority, Riyadh, 2005-06. 16. Riyadh Insulator Field Testing Site. Submitted to Saudi Electricity Company, Riyadh, 2005-06. 17. Technical training on pavement distress and pavement evaluation to Tabuk Municipality. Submitted to Tabuk Municipality, 2005-06. 18. Carburization mechanism of high-temperature alloys: applications in the petrochemical industry. Submitted to SABIC Technology Center (Materials and Corrosion Section), Al-Jubail, 2006-07. 19. Selection of materials for welded-tube applications in the petrochemical industry. Submitted to SABIC Technology Center (Materials and Corrosion Section), Al-Jubail, 2006-07. 20. A study on utilizing sulfur concrete in structural components and development of a stable sulfur modifier. Submitted to Saudi Aramco, 2007-08. 21. A study on utilizing oil ash in cement-based building materials. Submitted to Saudi Aramco, 2007-08. 22. Development of system for seismic risk assessment of Saudi Aramco production facility. Submitted to CSD-Saudi Aramco, Dhahran, 2007-08. 23. Analysis and monitoring of crawler cranes. Submitted to CSD-Saudi Aramco, Dhahran, 2007-08. 24. All precast concrete bridges – an innovative new system for fast track construction. Submitted to Ministry of Transportation, Riyadh, Dhahran, 2007-08.